The Recipe for the Perfect Bar Cart! 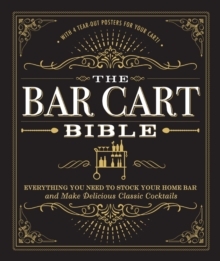 Like with any good drink, the secret to creating a winning bar cart is to understand its components. The Bar Cart Bible breaks down these elements and provides you with the necessary information, including:300+ cocktail recipesBottles to have on handA glassware guideRequired equipmentMeasurement chartsDefinitions of bartending terminologyGarnish suggestionsMixology tips4 pieces of frame-ready, decorative artNow isn't it time for a drink?